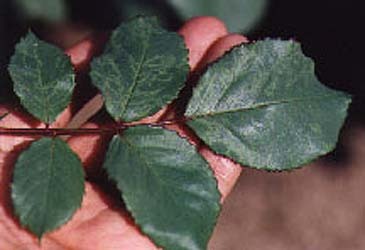 Mosaic is probably the most commonly found virus on roses but many other virus diseases also exist. While mosaic is transmitted by propagation other viruses can be transmitted by pollen, insect feeding or simply by mechanical contact. 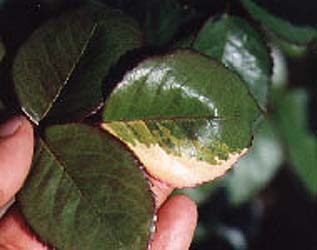 Symptoms of virus are usually dramatic manifestations of coloration, spotting or irregular distorted growth of leaves, flowers or growing points. 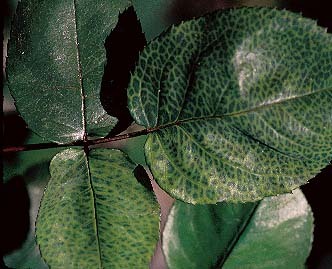 SYMPTOMS: Rose mosaic usually appears in spring as a distortion of growing tips or expanding leaves. 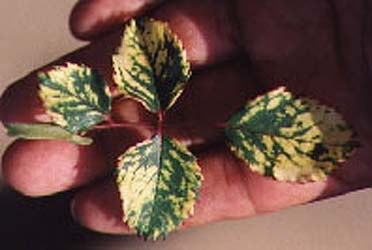 Later the leaves can appear to be wavy and have yellow lightening patterns, oak leaf patterns or simply gold to yellow veins. Plants infected with virus usually are slower to develop in spring than healthy plants and usually produce fewer good quality blooms. During the warm summer typical symptoms can disappear only to come back as fall and cooler temperatures arrive. CONTROL: Since there is no cure for the virus diseases it is important to purchase only quality materials which have no symptoms of the disease. 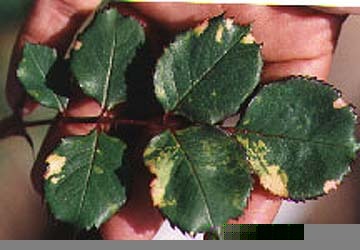 Some pathologists suspect that mosaic may be pollen transmitted which could prompt removal if other roses in the garden are valuable and not already infected. In some exhibition gardens the disease can actually be very common. 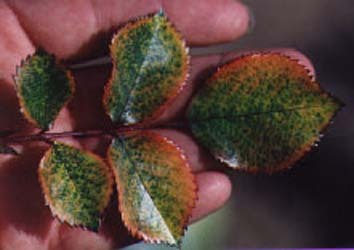 Propagation of buds from infected roses will probably result in transmission of the disease if the buds actually take. ACKNOWLEDGEMENTS: I would like to thank the following plant pathologists with the California Department of Food and Agriculture's Plant Pests Diagnostic Centre: Dan Opgenorth and Dennis Mayhew. They have given me invaluable advice in preparing this article. All the above pictures were taken by Baldo Villegas. Horst, R. K. 1983. 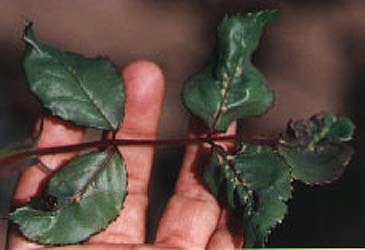 Compendium of Rose Diseases. The American Phytopathological Society, St. Paul, Minnesota. Pp. 26-27.